Cubs are exploring the idea of selling minority ownership shares as a way to help finance the stadium renovation, according to multiple sources within Chicago’s business community. Source confirmed the plans, describing those shares as a non-controlling interest while also cautioning that the Ricketts family hasn’t made any final decisions. Major League Baseball would need to approve any new investors. The Green Bay Packers are the best known example of a team that is publically owned. The shares of the Packers stock is not like stock on the NYSE or NASDAQ. Shares do not appreciate or depreciate in value, and stockholders cannot capitally gain from them. I would imagine that if the Cubs were to make an IPO, it would be along these lines. I have a hard time seeing MLB approving a deal like that. How exactly does the Packers GM get hired? This isn't public ownership, though, this would just be the opportunity to buy shares of a privately held company. At least those who own Packers stock are invited to annual meeting and can vote on who is in charge of the team (a situation not unlike how the two big Spanish soccer teams, Real Madrid and FC Barcelona, operate). This, as I understand it, is even more meaningless than owning Packers stock. Whatever perks it entails, if any, is up to the sole discretion of the majority owners, in this case the Ricketts. As the story mentions, it is not unlike how Reinsdorf controls the Bulls and White Sox, as the managing partner of a limited number of minority partners (who owns how many shares is a bit of a mystery). It's unclear to me whether the Ricketts are seeking to sell small souvenir shares, if you will, of say a few hundred dollars a piece, or more substantial minority shares as with the many owners of the Bulls and Sox. Shareholders elect who has discretion over management decisions. Whether they elect the Board who then elects an Executive Committee to decide who is in charge of the team, or how exactly that works, I do not know. The current Chairman, CEO and President is Mark Murphy, former Northwestern AD. I think this is an indication of what a mess Cub finances are right now. Their payroll is down to $92 million, 23rd in MLB. The punch line is only $77 million of that is for people currently on their roster. I can't believe the revenue projections (as developed by Crane Kenney) to pay for both the renovation and talent in the coming years. Also if anybody thinks that $300 million budget is going to hold up once they start tearing up that 100 year old pile of steel and concrete that's been sitting out in Chicago winters, they're dreaming. The awkward Thanksgiving dinner issue in all of this is just think of all the the TD Ameritrade stock they had to sell in 2009 to come up with the $150 million or so for the down payment on the deal. 2009. What do you think that stock is worth now? 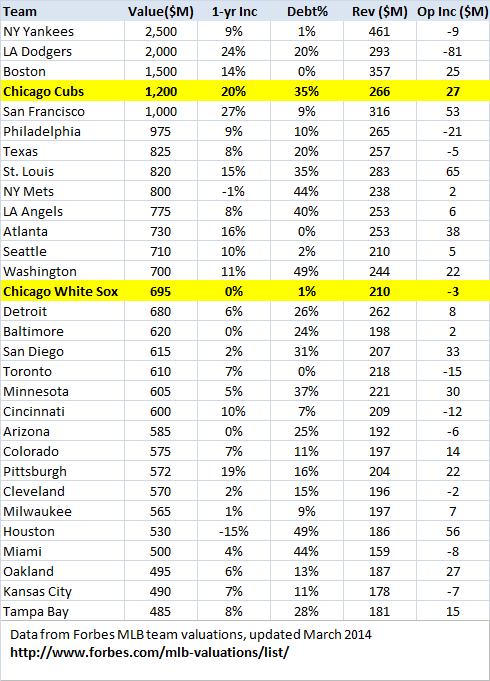 In their defense, though, the value of the Cubs has improved at least 30% since they bought them, though, hasn't it? And that's even without the mega TV deal they're going to get next off-season when they finally kick WGN to the curb. It's not uncommon to have minority owners of sports teams or any business. This isn't revolutionary, and no, it's the same as what the Packers have. Warren Buffet interested in investing in the Cubs, according to a source. It also keeps the team from ever leaving Green Bay. I am sure the people in Minnesota and Buffalo would take this "scam" any day to not have to hear about their team potentially moving. Look at the operating income of the Astros and Rays. It appears they are taking full advantage of revenue sharing. As far as the minority sharers, if you can get fans to buy them and essentially get free capital, it's worth a look. Last edited by soxfanreggie; 04-06-2014 at 06:42 AM.